The death of King Bhumibol Adulyadej, who would have been 89 in December, leaves Thailand bereft of a leader who steered the nation by demonstrating great care and attention to its people. For most of his seventy-year long reign King Bhumibol was a working monarch, most often pictured inspecting projects in the field, noting down needs and suggesting practical solutions. King Bhumibol successfully blended traditional and modern elements of monarchy, which helped him to establish a remarkable aura and unquestioned popularity. 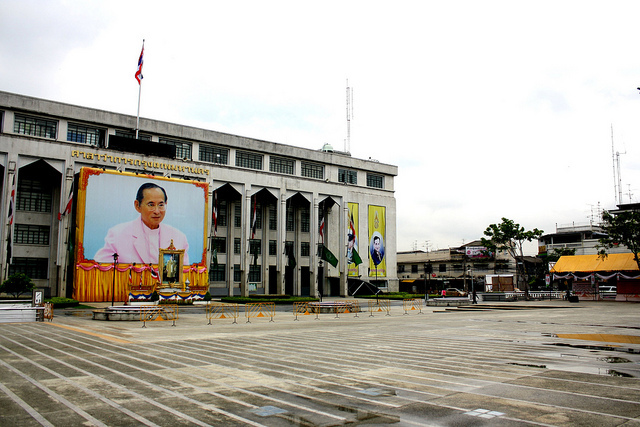 In an era of modern monarchs casting off ancient traditions in favour of the popular touch, King Bhumibol revived and recast arcane traditions of spiritual leadership and skillfully erected an imposing bureaucratic edifice around him, ensuring a connection with every Thai citizen. The question now, with the succession still in progress, is whether the institution he built will continue to enjoy the same prestige and play the same central guiding role in Thai society. The political upheaval of the past decade has left Thailand socially as well as politically polarised; there’s a desperate need for stable unifying leadership to address demands for reform and reconciliation. Although very few living Thais can recall the period before King Bhumibol, the throne he inherited from his brother King Mahidol in 1946, had been much weakened by political upheaval in the 1930s, the Pacific War and the threat of communism that precipitated military rule. That King Bhumibol was able to restore more benign civilian rule and set the country on the path to sustainable development was the foundation of his strength and popularity. One of King Bhumibol’s key roles was to ensure that querulous, power hungry politicians, officials and generals were kept in check. The king was seen as the arbiter of fractious infighting and the best judge of the moral character of the highest officials. While King Bhumibol was conscious of the need in a modern context to reinforce his legitimacy through good works, the society he presided over exploited the traditional symbolism of his leadership, especially at the elite level because it served their own selfish ends of power. Over the years, there were clearly many who cloaked abuses of power and justified repressive measures—such as strict lese majeste laws—using the aura and prestige of the throne. As he grew older, King Bhumibol was seen less frequently, appearing usually once a year to give an audience to senior officials where he exhorted people to abide by the rule of law and respect democracy. Thai politicians are bad at reconciling their own issues because they’re used to relying on their King as an intermediary, even if his preference was for weak coalition governments populated by cautious conservatives. And although he’s credited with taming the military after soldiers fired on student protestors in 1992, there were other instances before then and afterwards, when he endorsed military action against his people and supported military coups. Over the last few years, with the King withdrawn from public life and confined to hospital, speculation intensified about the succession. Crown Prince Maha Vajiralongkorn, who’s 64, was confirmed as heir to the throne in 1972, so according to the succession law, his claim to the throne is legal and legitimate. But the Crown Prince reportedly asked for a delay before he’s proclaimed so he can mourn with the rest of the country. Meanwhile, Thais are feeling uncertain about the future without a much loved king whose immense moral charisma meant that people relied on him for resolving all their problems. There are those in the highly polarised political context who hope to see the monarchy weakened, in particular because of the way it has been seen as supportive of the military’s intervention in politics. The political upheaval of the past decade has thrown up new political forces in the north and northeast of the country that feel less bound to the centralising, unifying ideology of the throne. Then there’s a vigorous insurgency in the deep south of the country where the Malay Muslim community seeks separation from the Kingdom. King Bhumibol’s departure therefore leaves Thailand without a strong source of unifying leadership at a critical juncture for the country. Neither the military, wielding power through a council of generals and a rubber stamp legislature stacked with military officers, nor the fractured political elite, can provide popular or legitimate leadership. The only leader with demonstrable popularity and charisma is former Prime Minister Thaksin Shinawatra, who has lived in exile for the past decade. Depending on which side of the divide they sit, many Thais either fervently hope or fear that the succession offers an opportunity for Thaksin to return, pardoned of the crimes he was convicted of and which he claims were trumped up. But with the military still in power, that seems unlikely for now. Michael Vatikiotis is Asia Regional Director of the Centre for Humanitarian Dialogue. He was formerly editor of the Far Eastern Economic Review and has been associated with Thailand professionally for more than thirty years. Image courtesy of Flickr user BernieCB.